Throughout Ferdinand Porsche and Anton Piëch’s ordeal in France, Ferry Porsche and his sister Louise Porsche-Piëch had kept things going at Gmünd, Austria by supervising the repair of prewar Volkswagens and VW bucket cars. Towards the end of 1946 there were more than 200 employees working at the Gmünd facility, which Ferry and Louise had wisely reorganized as an Austrian company under the name Porsche Konstruktionen GesmbH. 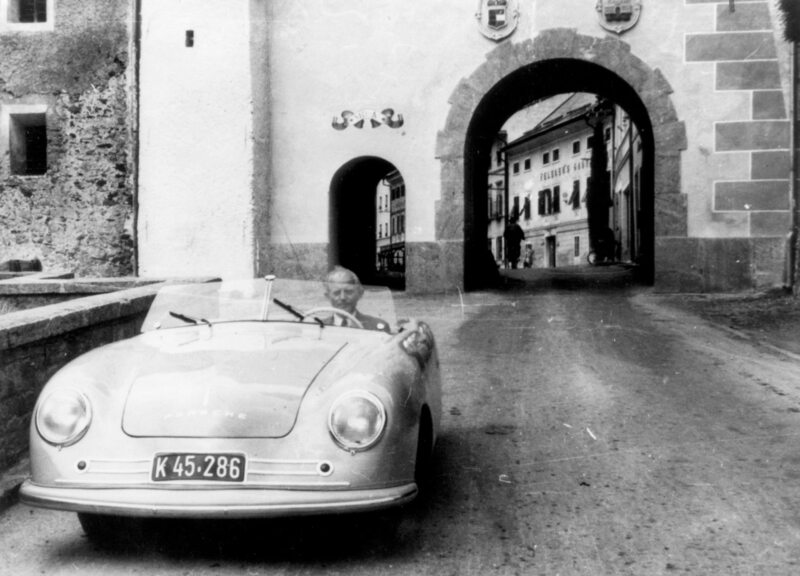 It was still tough going but in September 1946 fate turned irrevocably in Porsche’s favor when an Italian industrialist and amateur race driver named Piero Dusio entered their lives. Dusio had made a fortune selling war materials to the Italian government. Even being on the losing side had been profitable for him and in 1946 he bankrolled the development of an entire class of single-seat racecars, known by the contraction for Consorzio Industriale Sportivo Italia, gracefully shortened to Cisitalia. 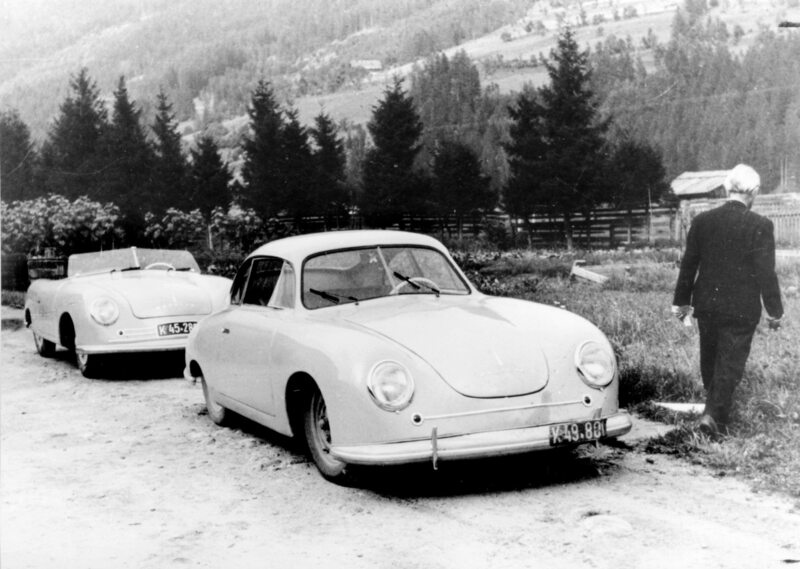 The beginning of the Porsche legend, the original 356-1 and 356-2 models outside the Gmünd werk in 1948. Among Dusio’s cadre of racing luminaries was legendary Italian race driver Tazio Nuvolari. As fate would have it, Nuvolari had driven for the Auto Union before the war and was familiar with Professor Porsche and the magnificent racecars he had designed. When he decided to resume his Grand Prix racing career both Nuvolari and Dusio found their way to Porsche’s doorstep through mutual friends, Carlo Abarth, who was married to Anton Piëch’s former secretary, and Rudolf Hruska, who had worked with Porsche in 1939. However, it was only after making contact with Louis Piëch and Ferry Porsche that Dusio discovered the plight of their father and offered to provide the necessary funds to secure his release. He had one million francs delivered to the French authorities through his friends, celebrated race drivers Louis Chiron and Raymond Sommer. On August 1, 1947 Ferdinand Porsche and Anton Piëch were released after almost two years in and out of French prisons. The money used to buy their freedom was payment for designing the Grand Prix car for Dusio and Nuvolari. Ferry Porsche and the staff in Gmünd completed the design for the Cisitalia Type 360 by October 1947. 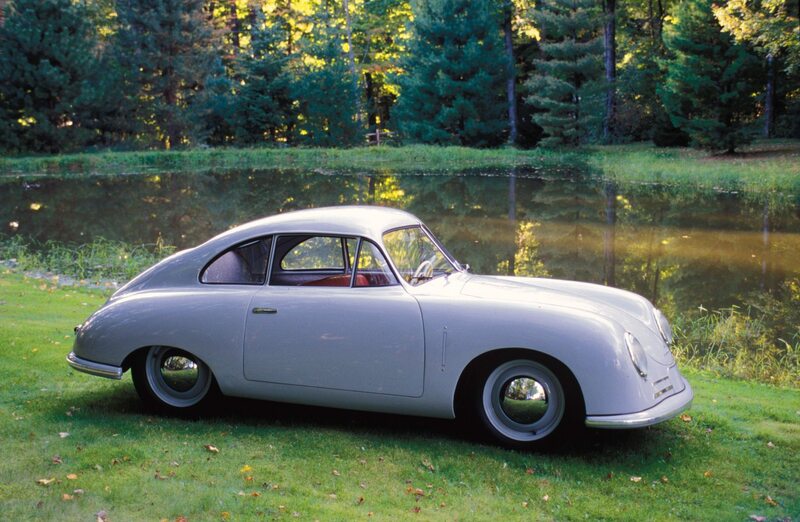 The innovative design utilized all wheel drive, which Porsche KG had pioneered during World War II. 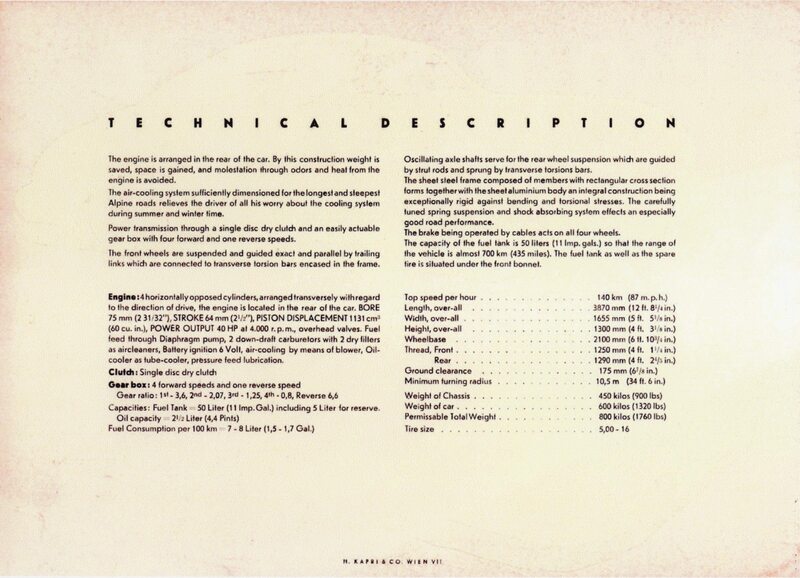 The engine was mounted amidships, a practice that would be copied numerous times in Porsche’s history. Renowned Italian race driver Tazio Nuvolari is pictured at the wheel of the Cisitalia in 1948. 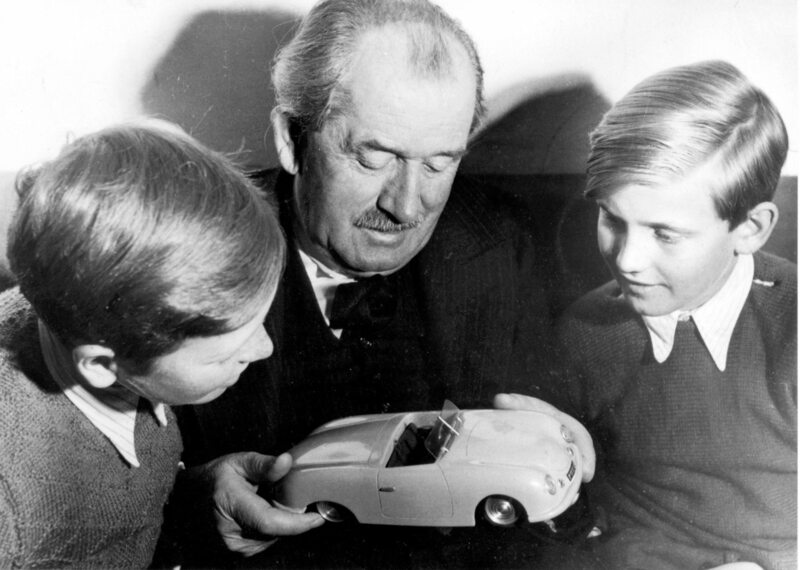 Ferdinand Porsche’s health was failing by 1949 when this intimate photo was taken of the company’s founder with two of his grandchildren, Ferdinand Piëch (left) and Ferry’s son Ferdinand Alexander “Butzi” Porsche. Butzi would grow up to become one of the most influential designers in the company’s history and Ferdinand Piëch head of VW/Audi. Unfortunately for Dusio, his unbridled enthusiasm for building cars had blinded him to an impending financial disaster. The costs of developing and producing the Type D46 Monoposto racecars, the Cisitalia 202 sport car, designed by Sergio Pinin Farina, and the Porsche Grand Prix racecar had exhausted his finances. By 1949 he had run through most of his money and Consorzio Industriale Sportivo Italia was bankrupt. 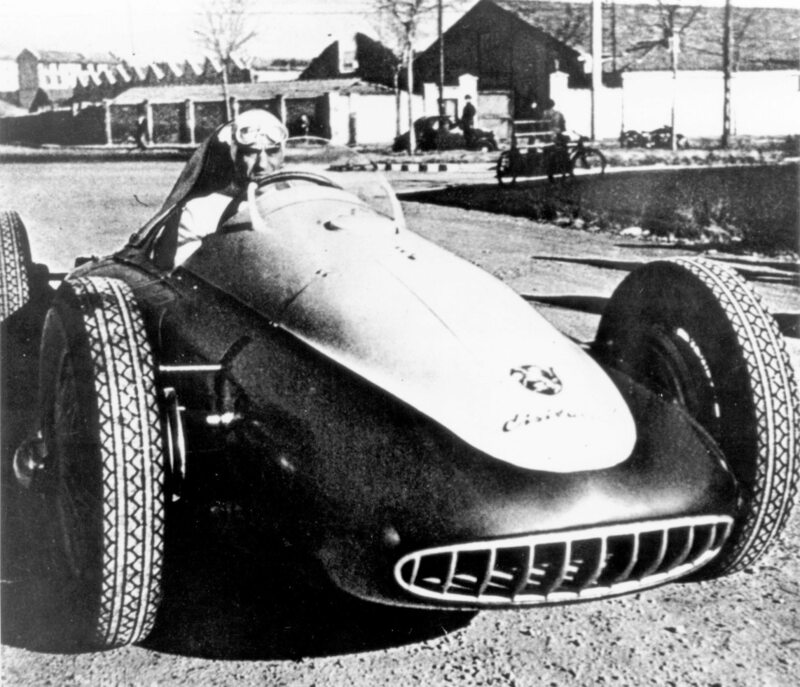 Dusio was forced to sell the remains of Cisitalia and then he hastily departed for Buenos Aires, along with the Porsche-designed Grand Prix racecar! Dusio’s legacy would be the groundbreaking Cisitalia 202 sports car and securing the freedom of Ferdinand Porsche. Having watched Dusio build the Cisitalia 202, using essentially off-the-shelf Fiat components, had rekindled Ferry’s desire to build a Porsche sports car doing essentially the same thing with VW parts. 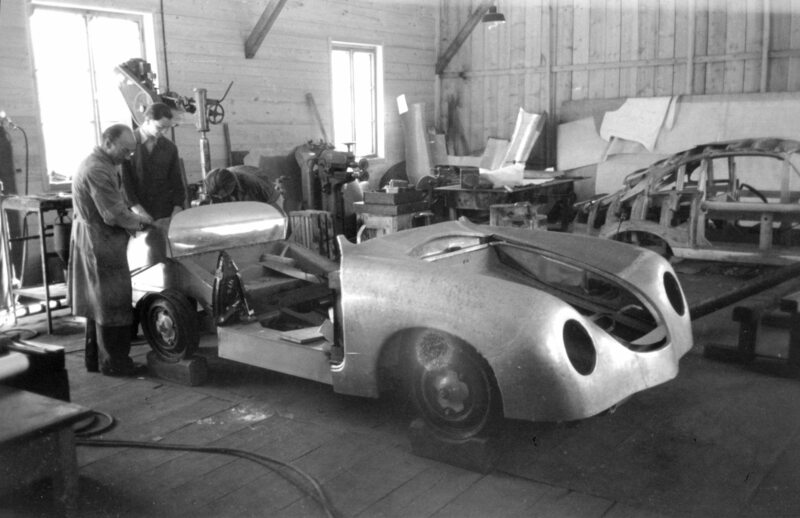 In 1947, almost a decade after the design had been completed, the plans for the VW Type 64 60K10 streamliner were about to be removed from their steel cases and dusted off. Porsche was going to build a car of its own. 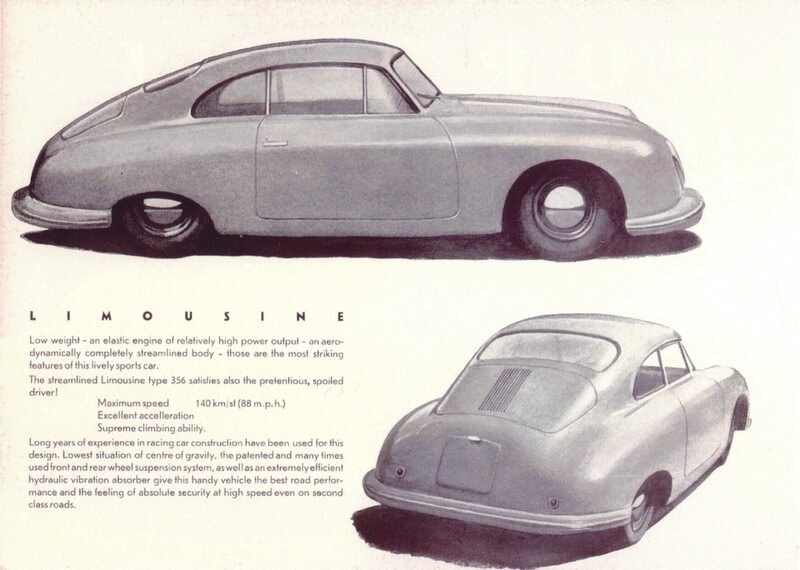 Erwin Komenda’s 1948 design for the 356-2 coupe body relied heavily on his prewar styling of the Type 64 60K10 Berlin-Rome streamliners. 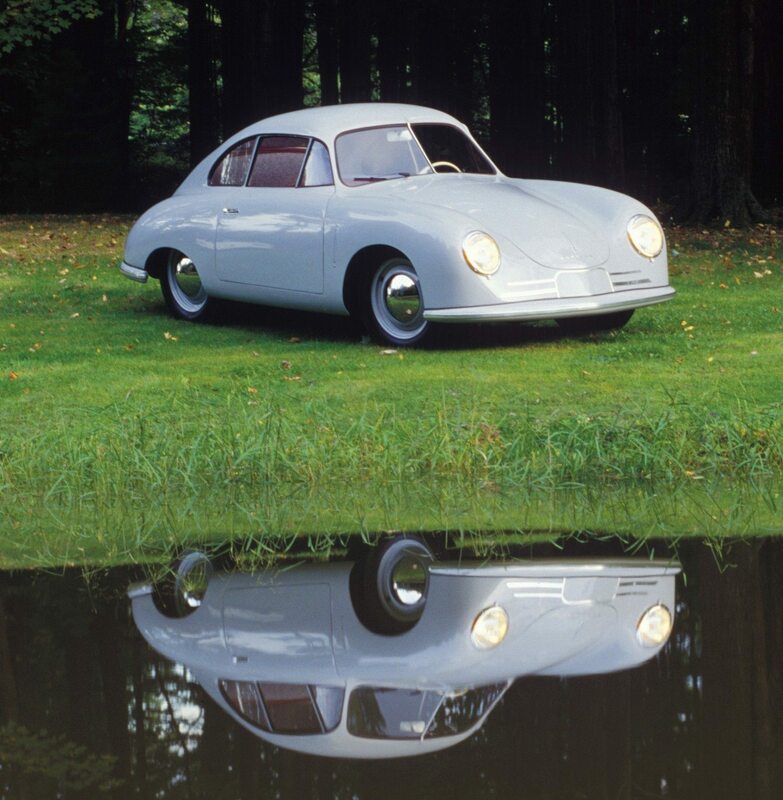 The aerodynamic profile of the 356 has evolved over the past 55 years into what is a still familiar silhouette. In 1947 Ferry Porsche, Karl Rabe, and Erwin Komenda began the design of a sports car to be built around Volkswagen components. The project was officially named the Type 356. In his design, Ferry Porsche used Volkswagen steering and braking systems, suspensions, transmissions and engines with slight modifications. Komenda and Ferry designed the first body, which was mounted over a tubular spaceframe. The aerodynamic lines of the open two-seater were based almost entirely on the Berlin-Rome racecars. The first 356 roadster body was hand-formed by Friedrich Weber, a brilliant metal craftsman who had joined Porsche in April 1948. Completed on June 8, 1948, the mid-engine 356-1 Gmünd roadster would become a test bed for the new sports model, however, for series production Porsche and Rabe had already decided on a more practical platform than the roadster’s hand-formed space frame, and an engine mounted in the rear, rather than amidships. Although the Gmünd roadster was never put into production one could regard the 356-1 as the original concept for the legendary 550 Spyder of 1953, and currently, the highly successful Porsche Boxster, which also uses a mid-engine layout. 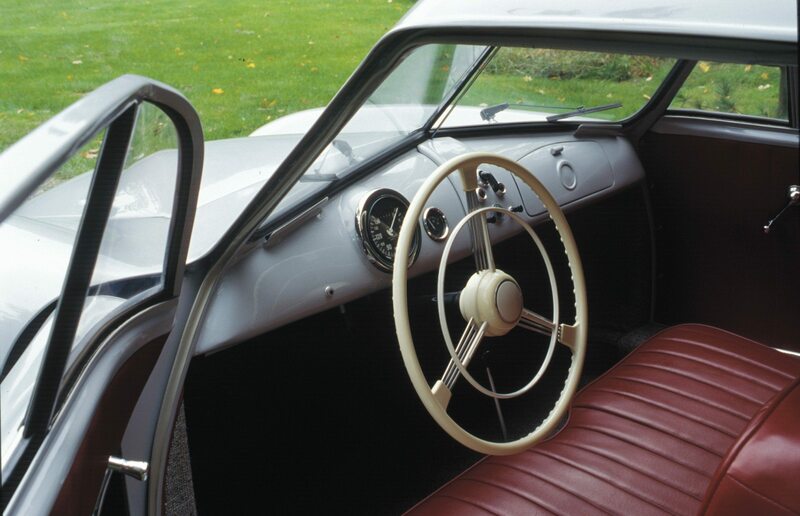 Production of the Type 356 began in Gmünd in 1948. A workshop in the converted Austrian sawmill was used to build the chassis. The first Porsche sports cars were virtually hand built in the shops at Gmünd. Here the body for a coupe is being fabricated. In the background is the wooden styling buck over which aluminum panels were formed for the body. The Type 356-2 utilized a newly designed frame consisting of a welded steel platform, strengthened through the cockpit area by boxed square-section side sills and a small center tunnel (the latter used chiefly for controls and wiring). A front box was joined to the side sills by angled panels that distributed the stresses. The box completely enclosed the foot well and suspension housings, and extended forward to the nose of the car. At the rear, a sheet steel structure rose up and back from the side sills and arched above the space, which would be occupied by the engine and axles. 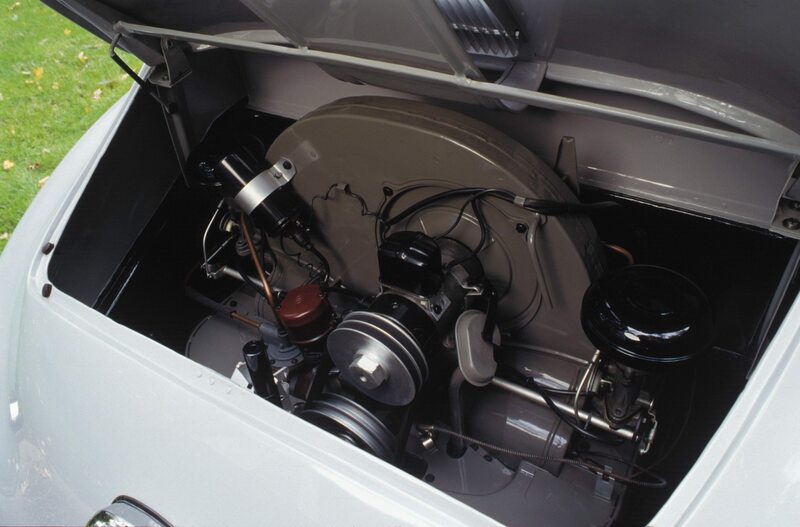 Following the design his father had established with the Volkswagen, Ferry positioned the flat four-cylinder boxer engine behind the rear axle. The body for the car was all aluminum, except for the doors, which were steel. Completed in July 1948, the 356-2 would be the final pre-production prototype. Porsche planned on producing both coupe and cabriolet versions of the 356 and Komenda’s design for the 356-2 coupe was even more accomplished than his rendering of the Gmünd cabriolet. The coupe featured a classic fastback roof design similar to the Berlin-Rome streamliners and Pinin Farina’s revolutionary Cisitalia 202. The result was a unique design that Porsche would continue to use with only minor alterations for more than a decade. 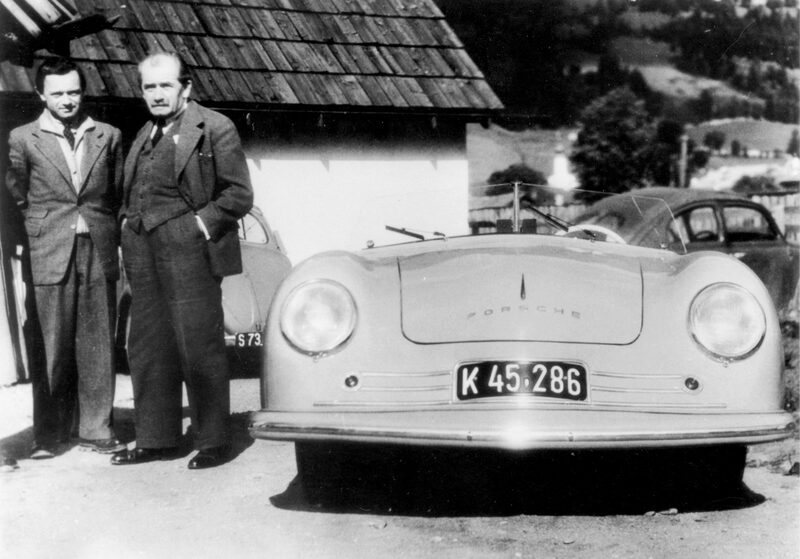 Ferry Porsche (left) and his father with the Gmünd roadster in 1948. His 20-month imprisonment had taken a toll on the elder Porsche’s health. He was 73 years old when his son and the staff at Gmünd competed the fist car to bear the PORSCHE name across its hood. Despite the lack of a wind tunnel to prove his design theories, Erwin Komenda’s years of experience as a stylist at Daimler-Benz, and as a racecar designer at Porsche KG, had allowed him to create an incredibly aerodynamic profile. Ferry often told the story of the poor man’s wind tunnel test, that of taping tufts of wool to the 356-2 and driving it at speed past Komenda and the design staff to see if the tufts laid flat against the body. They did, proving that the flow of air over the car was undisturbed by its shape. Porsche’s production manager Otto Huslein was photographed with the first Porsche 356 in 1948 just outside the town of Gmünd, Austria. By the summer of 1948 the first 356 Porsches were completed in Gmünd, although there had been numerous difficulties, particularly with sourcing parts from VW and acquiring the sheet aluminum from which body panels were hand formed over wooden styling bucks. Most everything Porsche required was delivered to Gmünd by way of Switzerland, through the cooperation of two Swiss businessmen, Rupert Von Senger, who owned a Zürich advertising agency and his associate Bernhard Blank, who had a successful automobile dealership. As Swiss nationals they were free to travel and trade internationally, thus providing Porsche with a pipeline for supplies that would otherwise have been denied them in the early postwar years. Despite the numerous obstacles encountered throughout the year, the first 356 Porsches were of excellent quality; each was virtually hand-made under the watchful eyes of Ferry Porsche, Karl Rabe and Erwin Komenda. The assembly process at Gmünd was very slow since the 356 was in a continual state of change in 1948 with various alterations to the suspension, body, and particularly VW-based engines, which were modified by Porsche engineers to deliver performance better suited to a sports car. Not only were they more powerful, capable of propelling the 356 to speeds in excess of 80 mph, but also more fuel efficient than the VW Beetle, averaging 30 to 34 mpg. Porsche designed the VW engine utilized in the 356. The horizontally opposed, four-cylinder boxer engine—so named for the piston’s reciprocating movement, toward and away from each other like two boxers sparring—displaced 1131cc (75mm x 64mm bore x stroke) developing 46-horsepower at 4000 rpm. Even with this modest output the 356 coupe could attain a top speed of 88 mph thanks in part to its wind cheating profile. The majority of time was spent building the coupe and cabriolet bodies, which were fabricated by the same men who had made prototype and racecar bodies for Porsche KG since the 1930s. Ferry once remarked he had been amazed that Porsche was able to succeed in producing 46 cars the first year. Several important events had begun to reshape West Germany by the end of 1948. On June 20, the new German Deutschmark had replaced the devalued prewar Reichsmark. The new currency helped to wash away the stigma of the Third Reich, and to stimulate the lagging economy every German citizen was given 40 Deutschmarks. The Marshall Plan proposed by U.S. Secretary of State George C. Marshall in 1947 was also pumping millions of dollars into Europe to help countries rebuild their war torn industries, including Italy and Germany. The controlled economy implemented after the war was also abolished and a free market economy introduced in 1948 to encourage German trade and industry. For Porsche, this led to a significant turn of events. A contract was signed in September with Volkswagen AG to provide the parts necessary from Wolfsburg for the manufacture of the 356. In addition VW agreed to sell and service Porsche sports cars through its dealer network, and more importantly, since Porsche KG had originally designed the Volkswagen, the company would now receive a 5 Deutschmark royalty on every VW produced! This was an historic milestone. “The VW was now our intellectual property,” wrote Ferry, whose dream of building his own car had finally come true. 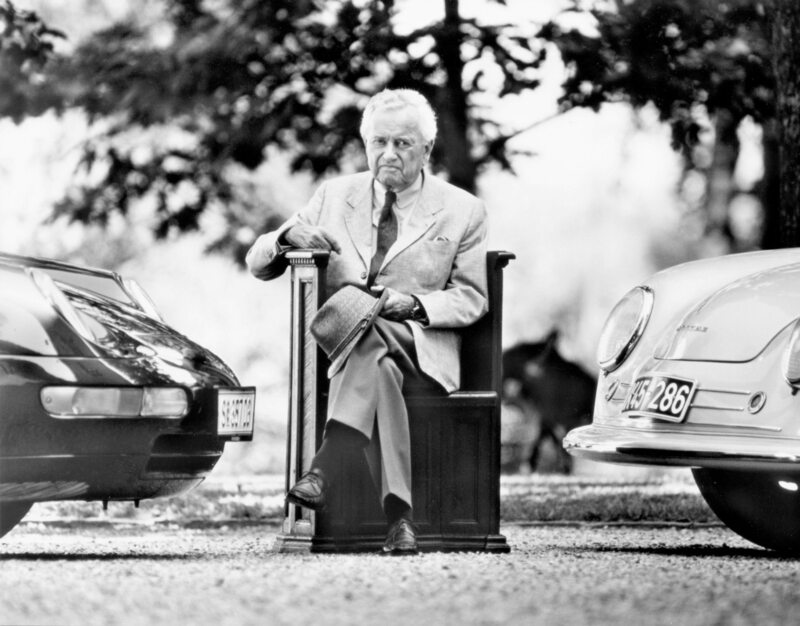 On the occasion of his 85th birthday on September 19, 1994, Ferry Porsche posed with a 996 Carrera and the famous 1948 Gmünd Roadster. 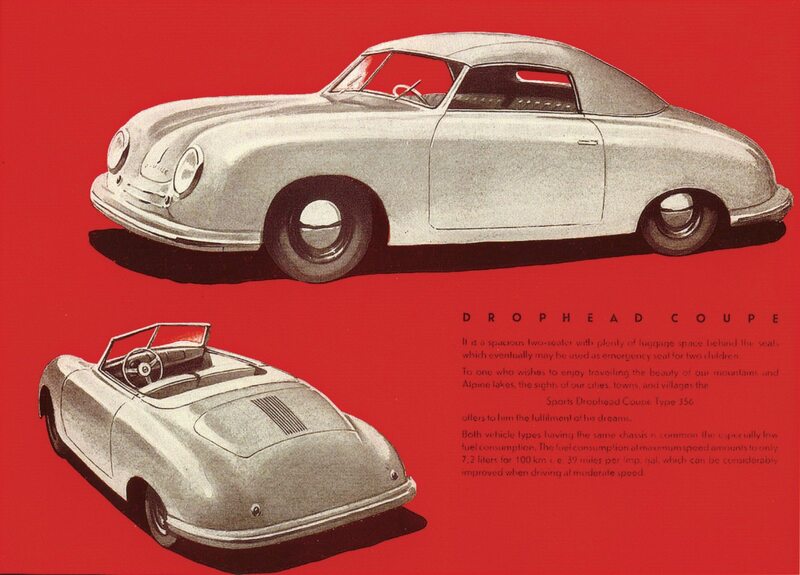 The first Porsche catalogue, a simple four-page folder, appeared in the late summer of 1948. Published in Vienna, in German, English and French, it contained drawings of both coupe and cabriolet. The following March, Porsche cars were exhibited for the first time at the 1949 Geneva Automobile Show. For the Porsche family, the war was finally over. 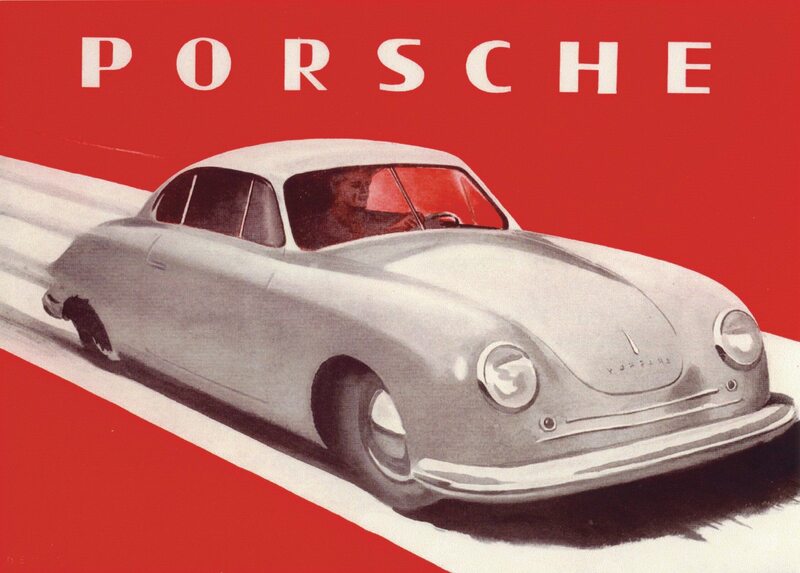 The English version of the first Porsche sales brochure published in Vienna in 1948. This marked the official birth of the Porsche sports car and the beginning of a new era is the history of the automobile. If you have an early model Porsche or another collectible you’d like to insure with us, let us show you how we are more than just another collector vehicle insurance company. We want to protect your passion! Click below for an online quote, or give us a call at 800.678.5173.